Milo is fascinated by our computers. One day I caught him in the office banging on my keyboard and when I went over to see if he had done any damage I saw that he had installed updates to my Outlook program. How he did it, I do not know. 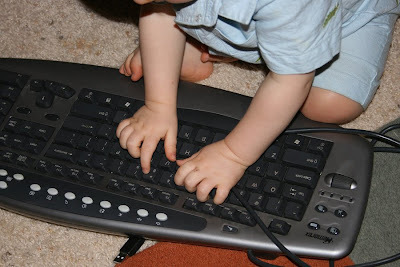 But after that I saw that I had to be more careful about letting him touch my computer. Chris happened to have an old key board so we gave it to Milo to play with so he would hopefully be satisfied with that and leave ours alone. He LOVES it. 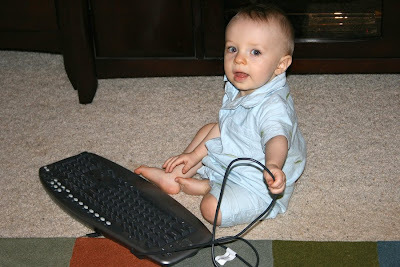 He will sit there for quite a while typing away. 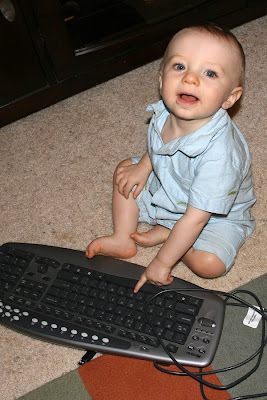 I swear he's going to know more than I do about computers by the time that he's two. 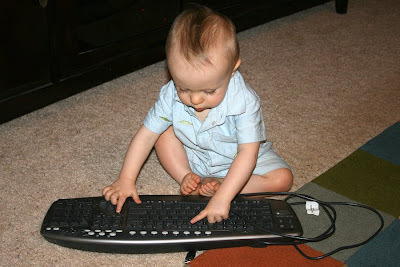 Daddy was babysitting the other night and got these shots of him playing with his keyboard. Our Little Budding Computer Genius He's still peck typing but hey, so is Momma. "I think I have figured out your problem...it's not plugged in." Note the cookie crumbs on him face. Can you tell daddy was babysitting? LOL!